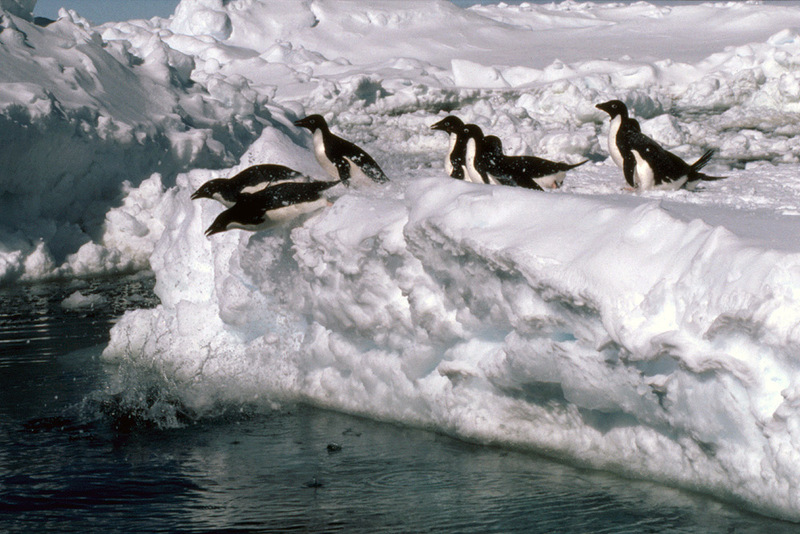 Antarctic penguins run a constant risk when entering or leaving the water from the almost ever-present danger of their main predator, the leopard seal. Leopard seals tend not to chase penguins in open sea, but hang around the places where they jump into the sea from their nesting areas, or where they leave the sea again as this is gives much more productive hunting. This gives the penguins a problem when going into the sea, they have to enter it to go fishing and to get places, but being the first one in means that they're first in line for any potential leopard seals. Hanging back isn't any better though as they may get left behind and end up jumping in on their own. What happens therefore is that they gather at the edge of the water becoming quite animated and jostling for position until one near to the edge gets pushed or jumps in - that's the signal for the rest, as the odds of survival are far greater when you're part of a large group, they then all dive in in rapid succession.